The Roanoke Valley Community Health Initiative (RV-CHI) with support from Healthy Places NC an initiative of the Kate B. Reynolds Charitable Trust, is putting resources for physical activity and recreation at people’s fingertips with the release of the Places to Explore, Move and Play map. 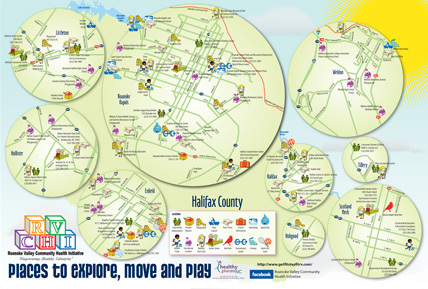 The map highlights community organizations, pools, farmers markets, parks, trails, senior centers, playgrounds and more across Halifax County. The vision of the Roanoke Valley Community Health Initiative is that Roanoke Valley families and individuals are empowered to lead healthy lifestyles. The mission of the Roanoke Valley Community Health Initiative is to promote healthy living through education, empowerment, and health access. The Roanoke Valley Community Health Initiative (RV-CHI) was established to help improve overall health of Roanoke Valley residents through collective prevention and intervention efforts of a network of community organizations. The current focus of the RV-CHI is improving health by reducing the prevalence of childhood obesity. The RV-CHI is a joint effort of area businesses, child and family agencies, and community-based organizations dedicated to addressing healthy eating habits and physical activity opportunities in the community that will have a lasting impact on health outcomes. 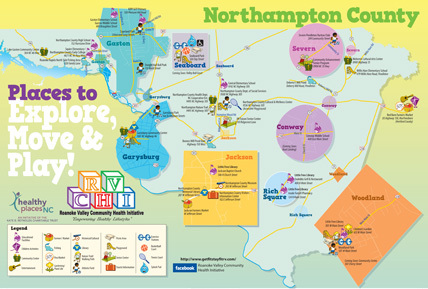 Our primary goal is to provide information and resources to help all families begin to understand the importance of healthy eating and physical activity to address the challenges presented by obesity. We further strive to become a healthier community with healthy, accessible, affordable foods and easy access to exercise and physical activities to decrease the incidence and impact of illnesses such as diabetes and heart Disease within our communities. 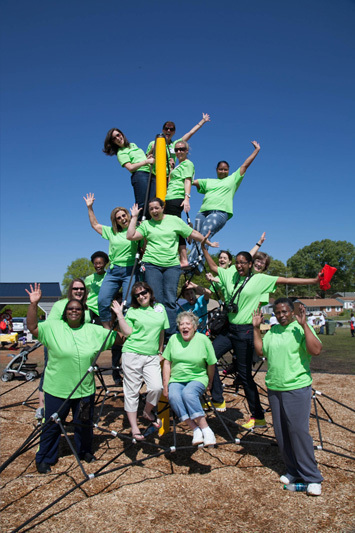 In the spring of 2013, the Community Health Initiative sponsored a Family Fun Fest. Hundreds of Roanoke Valley residents attended to event. The theme of the Family Fun Fest was Let’s Learn, Let’s Move, and Let’s Play. The purpose of the event was to encourage families in the Roanoke Valley to learn about local opportunities to improve health through healthier eating options such as consuming more fruits and vegetables, learning to grow vegetables in small spaces and preparing healthy kid-friendly snacks. Residents participated in fun activities such as dance, karate, hula hooping, jumping rope, beach ball tosses, parachuting and numerous other activities to engage families in creative ways to improve their overall health. The FamilyFest which will be held on April 26, 2014 at Ledgerwood Sports Complex in Roanoke Rapids will focus on “Moving and Playing. 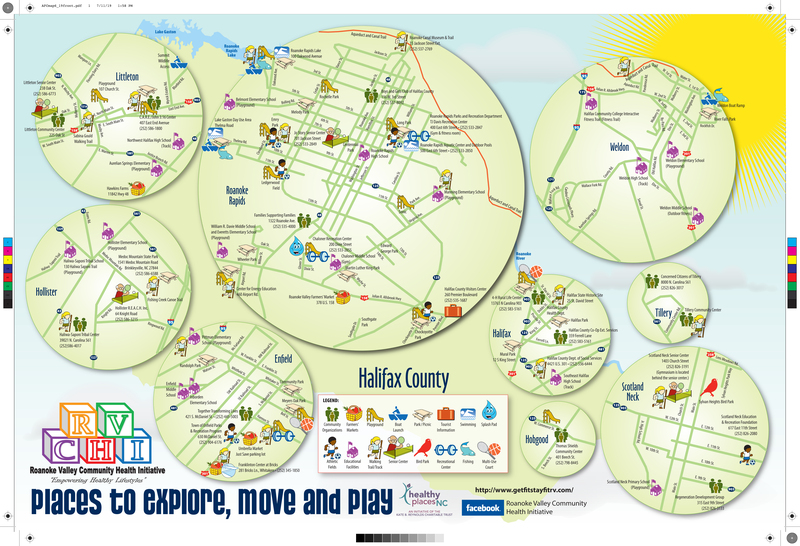 The initiative is also created a map of play for Halifax County identifying parks, playground and activity areas throughout Halifax County to assist residents in easily identifying ways to become more active and provide youth with much needed opportunities for exercise and activity. 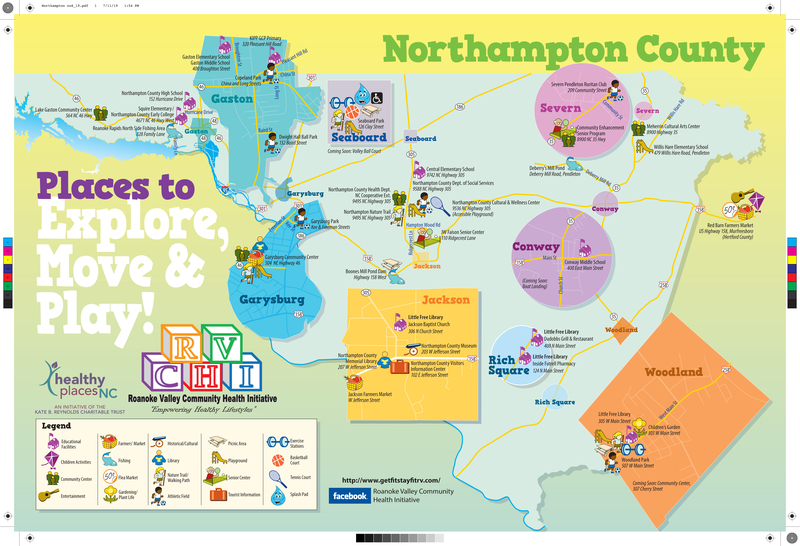 The RV-CHI is also supporting efforts to develop a county-wide recreation plan for Halifax County which seeks to address the recreational and outdoor space needs across the community which will ultimately improve health outcomes through recreation. Additionally the RV-CHI is supporting efforts of the Halifax County Public Health Systems to implement the CATCH program in the schools. The CATCH program is a health promotion and obesity prevention program for school aged children. The program guides kids on how to be healthy for a lifetime.